I was elected and graciously accepted to make the Easter cake for work. I found this old Wiltons pan and just followed the directions for the Easter eggs. The colors turned out perfect! I have found that using regular liquid food coloring works better to color my buttercream than does the Wiltons gel colors. This Easter I wanted to create a fun and colorful cake with a spring-time flavor so I made a lemon cake with lemon curd filling decorated with lost of bright and cheery Easter eggs. 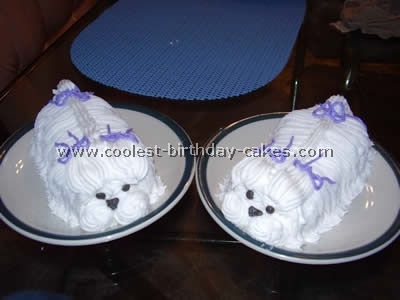 Since our entire family was going to be at our house I made two 10inch cakes, each 3″ high, so it was a good size cake. I flavored the cakes with lemon flavoring and lemon zest for a fresh lemon flavor. Days ahead I prepared my lemon curd. Before I assembled the cake I leveled them off and on the bottom tier I piped a thick boarder of icing to keep in the curd so it didn’t spew out the sides when the top layer went on. To make the Easter eggs I used an oval shaped fondant cutter and lightly made impressions on the top and along the sides. 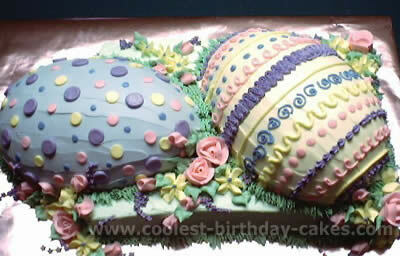 With different colored butter cream I outlined the eggs and decorated each individually. 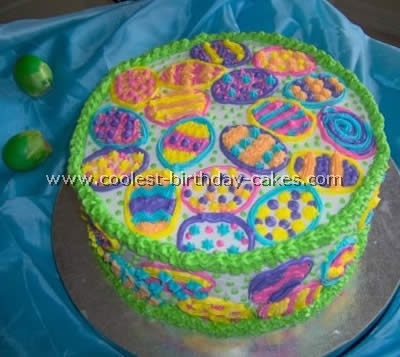 To finish off the cake I used lime green icing to make the boarders and polka-dots on the cake. This was an Easter Eggs cake I made for my cousin, who’s birthday was on Easter this year. After baking three 10″ rounds, I stacked two rounds layered with raspberry filling and cut three egg shapes out of the remaining 10″ round. 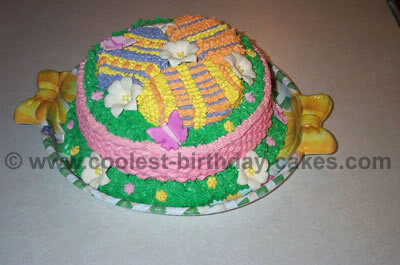 Basket weave design was used for the side and assorted tips were used to decorate the eggs. I made gum paste Calla Lilies and butterflies, colored with petal dusts, and added after icing. Instead of placing the cake on foil covered cardboard, I placed it on a plastic serving tray found in the Easter section of the grocery store. My daughter’s birthday is near Easter, so we combine the 2 events. This year I made and Easter Eggs cake. I used an Easter egg pan with a white cake mix. Then I used Smarties and frosting with a writing tip to decorate. My daughter loved her Easter cake! 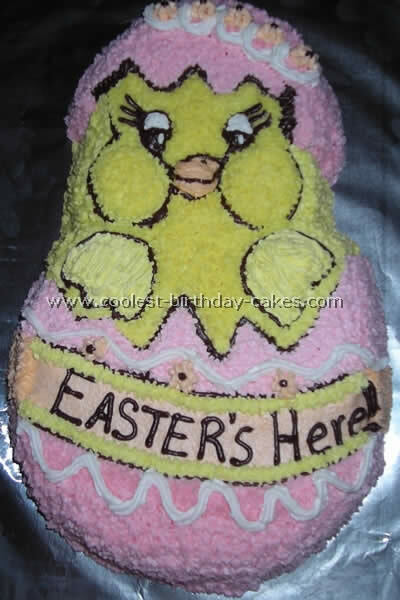 This Easter eggs cake is actually for my husband’s birthday each year -always near Easter (two good reasons for cake!). 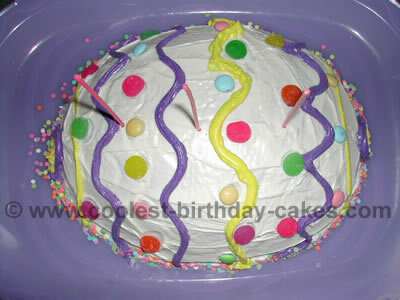 I use the Wilton egg shaped mold and follow a boxed cake recipe. 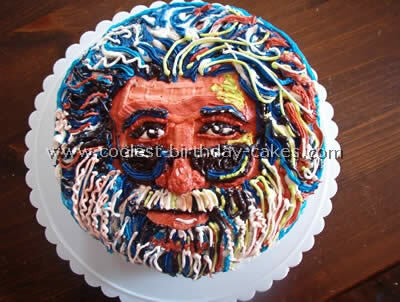 I usually use cream cheese frosting, b/c the white is easy to tint with food coloring, and tastes good. I use the Wilton tip for the small star (16 I think) and I’ve chosen 3 coordinating colors. Each year I do different colors and choose paper goods to match. I typically use white to pipe the striped lines, but the directions on the insert show a variety of options. The lines are simple and quick. 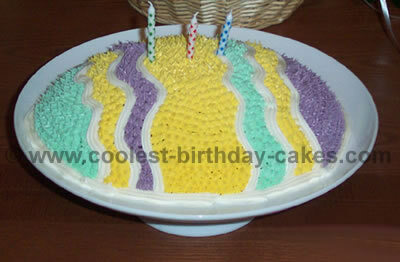 One tip: the mold needs to be placed on a cookie sheet to bake so the bottom of the cake comes out flat. This does increase cooking time, but will decrease the fuss time later! For this Easter Eggs cake, I used two Wilton half egg shapes on top of a 9×13. I used Wilton Decorator icing. The idea came from my imagination! This cake was for a preschool Easter party. BIG hit! You can’t hide these eggs!